​​​​​TEXAS – As the aging population in Texas continues to grow, so does the demand for available units in the senior living market. 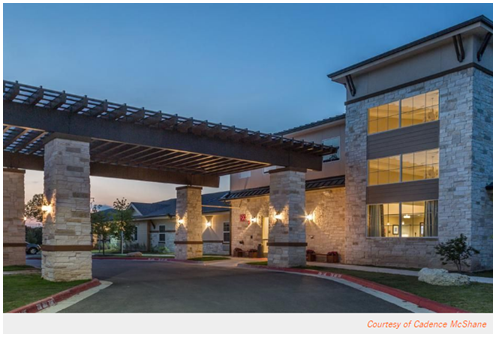 Cadence McShane Construction VP of Housing and Senior Living Dave Tague and Director of Business Development Sue Lehrer said the future of construction for senior living in Texas is healthy, particularly in the suburbs. ​The Gulf Region harbors an especially strong demographic of retirees with pensions socked away. The area's perennially expanding petrochemical industry has attracted many 45- to 60-year-old transplants, who are later followed by their senior parents. Texas’ senior living boom has caught the attention of—and is in part fueled by—foreign investors who are funneling capital into the “silver tsunami” of senior living opportunities throughout the state. The push to the suburbs is driven partially by concerns of urban oversaturation. Senior living demand has eased up in the densely populated Dallas, Houston, Austin and San Antonio metro areas. Investors are beginning to get fearful of overbuilding in some of the larger metropolitan areas and are now looking at smaller towns where options for senior living are more limited. ​Check​ out Housing Market Research for Dallas, Houston​, Austin​, and more!